The Royal Room Collective Music Ensemble is a 12-15 piece band featuring Seattle’s finest and most innovative improvisers under the direction of composer Wayne Horvitz. The RRCME performs Mr. Horvitz’s compositions in a loosely constructed format which uses a combination of on-the-spot (re)arranging and various other techniques, some of which have come to be known as “conduction”. Wayne Horvitz first performed in Butch Morris’s Conduction Ensemble in 1987 at The New School for Social Research in New York City. Twenty four years later, in the summer of 2011, Horvitz began to experiment with his own approach to Conduction while co-leading an experimental big band with composer John Hollenbeck at Cornish College of the Arts. Horvitz added to Morris’ original Conduction symbols, a series of numbers which correlated to specific motifs derived from the compositions. 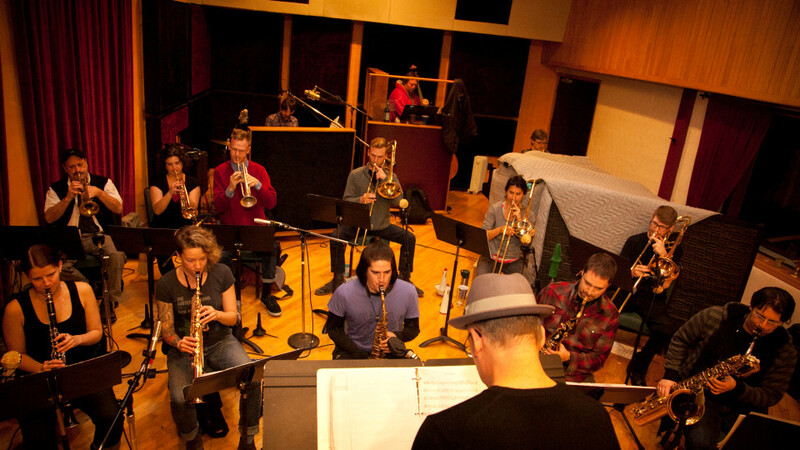 Upon the opening of The Royal Room, Horvitz took the opportunity to form his own big band to perform his compositions utilizing this approach. Regular members include Beth Fleenor, Al Keith, Sam Boshnack, Ryan Burns, Geoff Harper, Greg Sinibaldi, Jacob Zimmerman, Steve O Brien, Craig Flory, Eric Eagle, Kate Olson, Naomi Siegel, Haley Freedlund, Jacob Herring and Wayne Horvitz. Featured guests have included Bobby Previte, Greg Campbell, Stuart Dempster, and Briggan Krauss, Neil Welch and Ivan Artega.